Apparently, Sarah Fording is majoring in bad karma. For her thesis project, she has the bright idea to invite her friends for a weekend at her prof’s cabin, where she will film them experiencing the scares she has pre-planned. Right, because what could go wrong? Of course, she has some unexpected help in James Simpson’s Definition of Fear (trailer here), which screens during the 2016 Idyllwild International Festival of Cinema. With her closed circuit cameras in place, Fording arrives with her pals Victoria Burns, Frankie Toms, and Rachel Moore. Mostly Fording has prepared recorded bumps in the night and the like. However, Burns goes off script when she insists she saw a menacing psycho-stalker in the woods. Oh, that’s just Oddle, the handyman Fording assures everyone. Nonetheless, the weirdness starts to pile up, so the women logically seek answers from the Ouija Board. Soon they are in touch with the spirit of “Mary,” who freaks them out even worse. 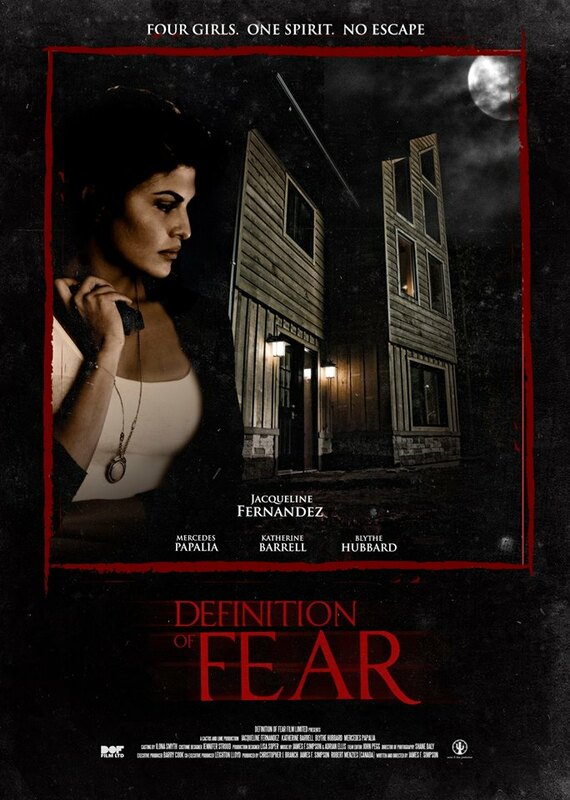 Definition has the distinction of being the American movie premiere of Sri Lankan Bollywood star Jacqueline Fernandez, so probably millions more viewers will it in than your average indie horror film. Somewhat fortunately, the film is actually rather good for what it is. Simpson cranks up the dread steadily and surely and the initial Ouija sessions are impressively tense. Yet, as is par for the spooky movie course, the women ultimately turn into gimpy quarterbacks who stay in the pocket way to long. When Mary tells them to “GO” they should be out the door, no more questions asked. Despite a few such shortcomings endemic to the genre, the attractive cast handles the supernatural business rather well. It is her showcase and Fernandez does indeed make quite an impression during Fording’s sultry scenes of possession (regular genre viewers will definitely want to see more of her). 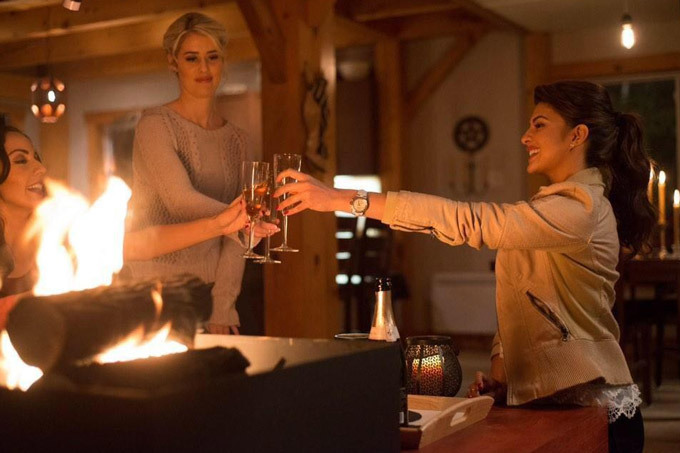 As the “sensitive” Burns, Katherine Barrell seems genuinely terrified. Blythe Hubbard’s Moore is refreshingly down-to-earth and relatively proactive, while Mercedes Papalia shows pleasantly surprising range as Toms. The fab four all hold up their end, but none of their characters seem like logical candidates to be the “final girl,” if you know the rules—not that anyone will object. Still, they mostly keep it clean, despite a game of Truth or Dare. It is a far cry from this year’s It Follows, but if you dig old dark house movies, it is certainly entertaining. Recommended for horror and Bollywood fans, Definition of Fear screens this Thursday (1/7) and Saturday (1/9) at the Idyllwild International Festival of Cinema.